Deciduous woodlands are typical of a temperate climate, with half of the year being a growth period followed by a cool winter. 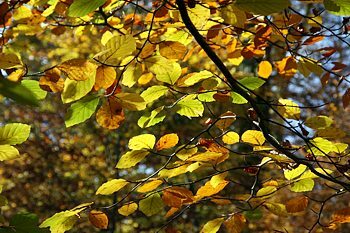 Leaves will be shed at this time due to unsuitable conditions for photosynthesis and possible water problems (lack of water as it is frozen in the earth). The woodland community displays horizontal zoning with much of this due to the limiting factor of light. The canopy and shrub layers will be of woody perennials whilst the field and ground layers are herbaceous types, dying back by the late autumn. These are mainly perennials to combat the competition to establish itself. The field and ground layers exhibit considerable diversity and are most prolific in spring, flowering before the leaves of the canopy reduce the light. Deciduous woods display a marked change over a period of around six month, from spring to early autumn. See the Woodland Season. Fungi are especially prolific in the ground layer during autumn. The richness of plant life and the stability of the community leads to a wide diversity of animals. layers or zones are visible. 1. the canopy layer: in temperate woods (unlike tropical forests) only a few species are present. One or two species are dominant and give their name to the community, e.g. oak. The trees making up the canopy determine the microclimate of the wood. Different species will have differing effects, mainly in the intensity of light they allow through. 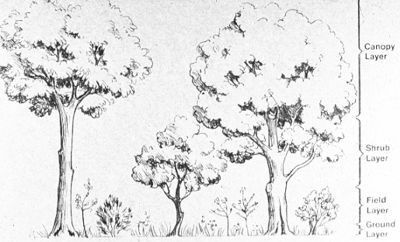 2. the shrub layer: made up of small trees unable to reach the canopy, e.g. hazel, but which can thrive in the semi shade produced by the canopy layer. Evergreen shrubs, e.g. holly, are well adapted. Juvenile canopy trees pass through this layer on the way to the top and are not classified as part of the shrub layer. These young trees have a low rate of photosynthesis, producing fewer leaves and no fruits. The energy produced is used to grow taller to reach the light. Each layer may be further stratified, particularly the field layer. Stratification of the root system also occurs underground. Each layer has an associated group of animals, so a stratification of the fauna will also occur. 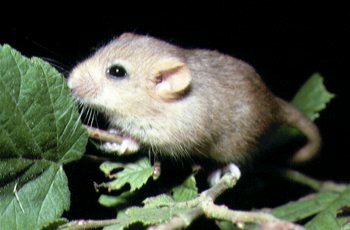 Squirrels predominate in the canopy, dormice in hazel shrub and wood mice on the ground. With their mobility the larger species may be able to move between layers. Insects show an even greater affinity to certain plants. The canopy layer allows up to 20% of light to filter through and may have a rich ground and field layer underneath. 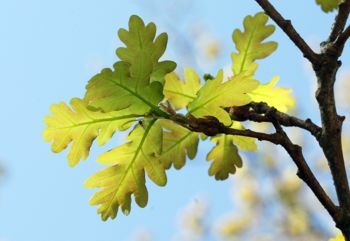 The canopy and shrub layer reduce air movements and help produce a stable environment; temperature fluctuation is low in oak woods.